Sudbury, ON – February 26, 2014 - Manitou Gold Inc. (TSX-V: MTU) (“Manitou” or the “Company”) announces the start of a winter diamond drill program on the Elora and Kenwest Projects located in Northwestern Ontario. The company anticipates completing approximately 1,200 metres of drilling to test the shallow portion of the highly prospective Jubilee gold zone, two prominent Soil Gas Hydrocarbon (SGH) geochemical anomalies, and the high grade gold showing on the #2 shear zone. Approximately 10 diamond drill holes are planned to evaluate the shallow portion (0-50m vertical depth) of the Jubilee Zone along a strike distance of 125 metres. Diamond drill results from previous project operators (Table 1) in conjunction with historical sampling results from the open cut and underground drift (Table 2) broadly outlines a shallow zone of gold mineralization (Figure 1). The company was able to re-log and re-assay the drill core from the past project operators’ drill programs (1998, 2004, 2006 and 2008) and has established a high level of confidence in these results. The sampling results from the open cut and underground drift were extracted from historical records which the Company has not attempted to duplicate at this time. The upcoming drill program will provide a substantially higher density of drilling in order to increase the level of confidence in this prospective area of gold mineralization. Additional holes along strike and at depth will be considered pending the results of the initial holes. During the 2013 summer exploration season the Company completed a Soil Gas Hydrocarbon (SGH) survey over portions of the Elora and Kenwest properties. The SGH survey identified two robust anomalies which both ranked 5.5 out of 6.0 (as interpreted and rated by Activation Laboratories Ltd.). The first anomaly is located approximately 500 metres southwest of the Jubilee zone in an area with little past exploration work. (Figure 2). The second SGH anomaly is located between the Jubilee Shear and the Big Master #1 Shear on the Overlook Shear Zone. Both SGH anomalies are proximal to the historical patent property boundary which is believed to have been a hindrance to previous exploration efforts. Several short holes are planned for the Big Master #2 high grade area where drilling in the past by the Company intersected numerous very shallow, high grade gold intersections (Table 3) including a spectacular intersection of 53,700 g/t Au over 0.55 m in drill hole KW-11-26. Several shallow holes are planned to trace this high grade gold occurrence to surface. The high gold content and shallow position may provide the company with an opportunity to recover this gold in a low cost low volume extraction. Todd Keast, President and CEO of Manitou commented, “The upcoming drill program will test a number of quality, shallow targets that we have developed over the past few months. 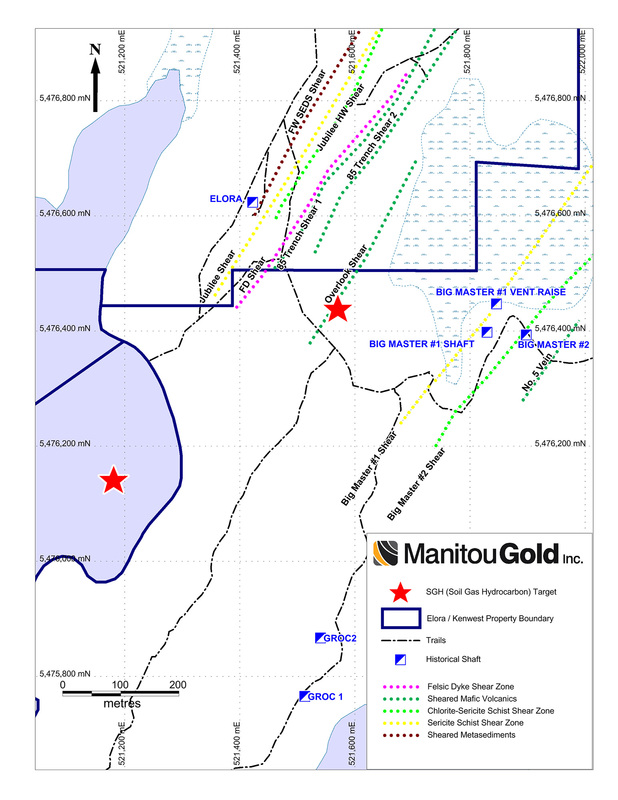 Manitou is focused on identifying near-surface, high grade gold mineralization. With approximately $1.4 million of cash on hand and an excellent portfolio of past-producing gold projects, the Company is uniquely positioned to add shareholder value”. 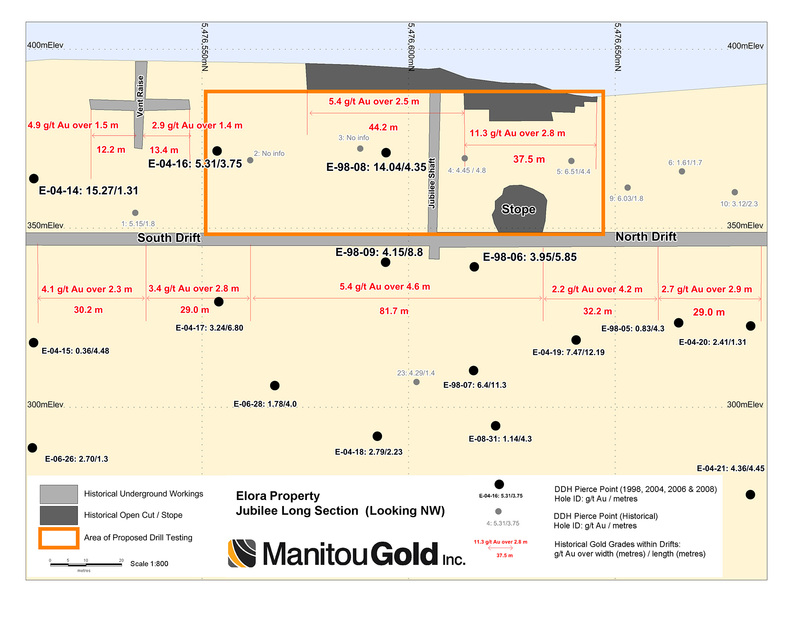 Manitou is a Canadian exploration company with a 150 square kilometre land package of highly prospective gold properties located in the historical Gold Rock District, in Northwestern Ontario. This under-explored area has a very attractive geological setting hosting 61 known gold occurrences including three past producing mines (Big Master, Laurentian and Elora). Until recently, the area has remained relatively untouched by modern-day exploration, pointing to excellent discovery potential over this large land package.